Come join the fun with Dinner, Dessert Auction, Raffle and the highlight of the evening, amazing Prime Time Kids Talent Show! 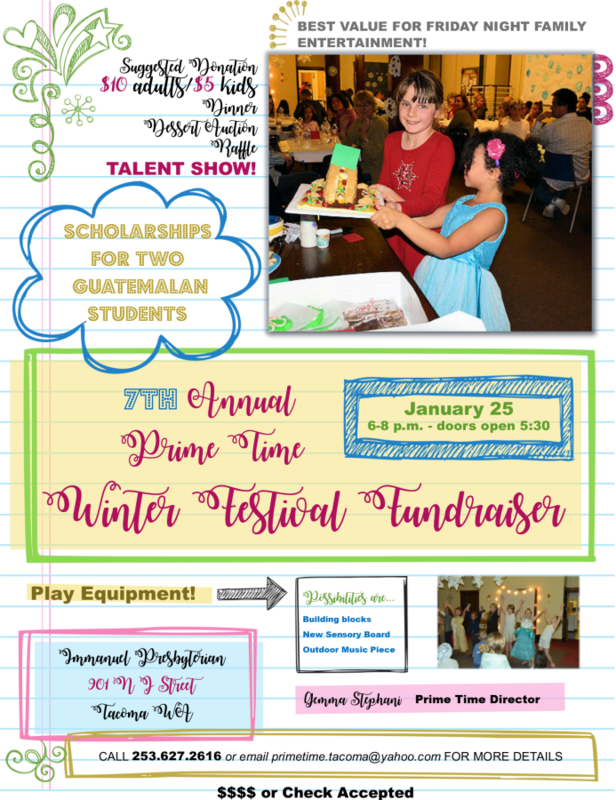 Help Prime Time raise money to fund new play building materials and support two students in Guatemala. Can’t make the event but want to contribute? You can donate dessert items. Just deliver your donation by 4 p.m. on January 25 or give Gemma a call and she would be happy to pick it up. Please see Debby in the office for tickets or call Prime Time and there will be one waiting for you. Suggested donation: $10 adult, $5 for kids. Support Prime Time, meet the families we serve, have fun, and enjoy a great dessert. We hope you will be able to join us! Doors open at 5:30 p.m. Dinner at 6 p.m.